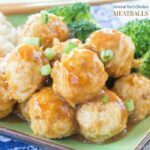 Easy turkey meatballs are coated in a sweet and savory mixture of your favorite barbecue sauce and apple cider for a simple dinner or party appetizer. Kids and adults love these! 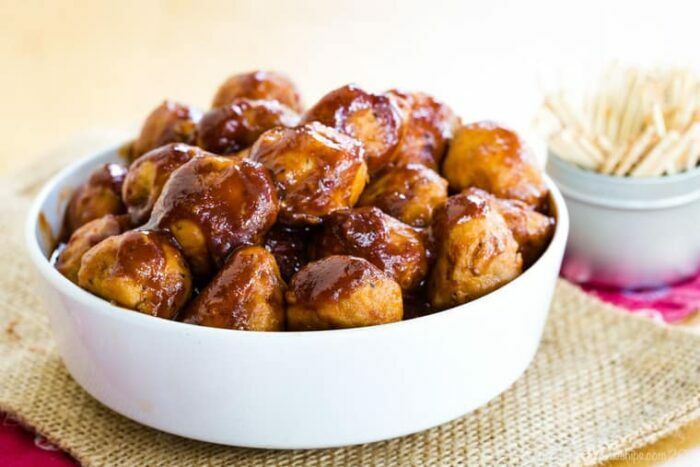 BBQ Turkey Meatballs are coated in a sweet and savory mixture of apple cider and your favorite barbecue sauce. This gives them flavor kids and adults are sure to love. They will definitely be one of your family’s favorite quick and easy dinner recipes. Toss them in a slow cooker and add some toothpicks for appetizer meatballs. And with a simple swap, they are even one of the best gluten-free appetizers. 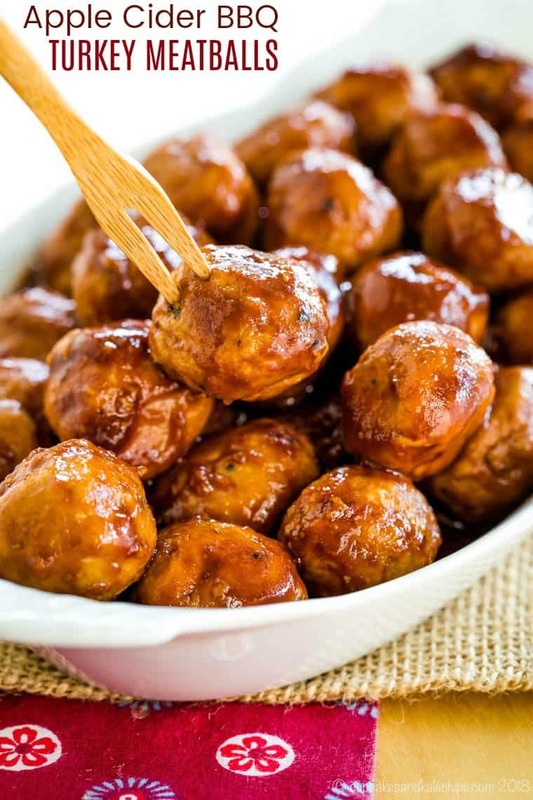 It only takes less than 30 minutes to make these Apple Cider BBQ Turkey Meatballs. When I started this blog, it was a hobby. It was my little corner of the internet to share my recipes and random ramblings. Those random ramblings used to flow out of me with almost no effort and I could bang out a blog post in no time. Then I discovered that I had to do things like add Pin descriptions so that if anyone pinned my recipes on Pinterest there would be a caption to make it clear whether they were pinning a recipe for Banana Chocolate Peanut Butter Energy Balls or meatballs, because, from a quick glance on a tiny phone screen, those can sometimes look the same. I also found out Google wanted my blog posts to be a certain length. And no specific length, mind you. Long enough to say what you need to say without saying more than you need to say or saying what you need to say too many times. Of course, all of this has to sound completely natural and in your own unique voice. But said in a way that compels people to make and like and comment and share. That, my friends, is a formula for writer’s block. And all of that comes together and means you get a recipe that involves turkey and apple cider in January. Because I didn’t have the wherewithal to pull it all together in November. And if I post it in January, by the time everyone is looking for recipes that involve turkey and apple cider, Google and Pinterest will know that this yummy little recipe exists. But you know, you can always make these as turkey appetizer meatballs for your upcoming game day gatherings. And since they are made with lean ground turkey, they are fairly light in the calorie department, making them a great option when you are trying to watch what you are eating after a holiday season filled with a few too many Snickerdoodle cookies. OK, maybe I am winning at January. And pre-winning for October when it’s all about apple cider. Ground turkey or ground turkey breast works fine for this recipe, depending on how you feel about the fat and calorie content of each. That’s your call. Place the ground turkey, egg, binder, and seasonings in a bowl, and gently work them together. You don’t want to work the mixture too much or the meatballs will be tough. Form balls with about a tablespoon of the turkey mixture. I like to use a small cookie scoop to get my portions. Bake the meatballs for about 15 minutes or until no longer pink. Stir together and heat a mixture of your favorite barbecue sauce and apple cider. Add the meatballs and stir to coat. Heat until everything is warmed through. Are Apple Cider BBQ Turkey Meatballs gluten free? As always, do read the labels of all of your ingredients. Things like spices and barbecue sauce can contain hidden sources of gluten. Most turkey meatball recipes are made with breadcrumbs. In this recipe, you can definitely use regular or gluten-free breadcrumbs. However, I don’t usually have those on hand, so I use what I do keep in my pantry. Ground oats – take some old fashioned oats and pulse a few time in a blender until they resemble the same consistency as breadcrumbs. I do not recommend quick oats as these expand quite a bit and can make the meatballs fragile and fall apart easily. Almond meal – while this is not a super low carb recipe due to the apple cider, you can reduce the carbs and make it grain free by using almond meal. 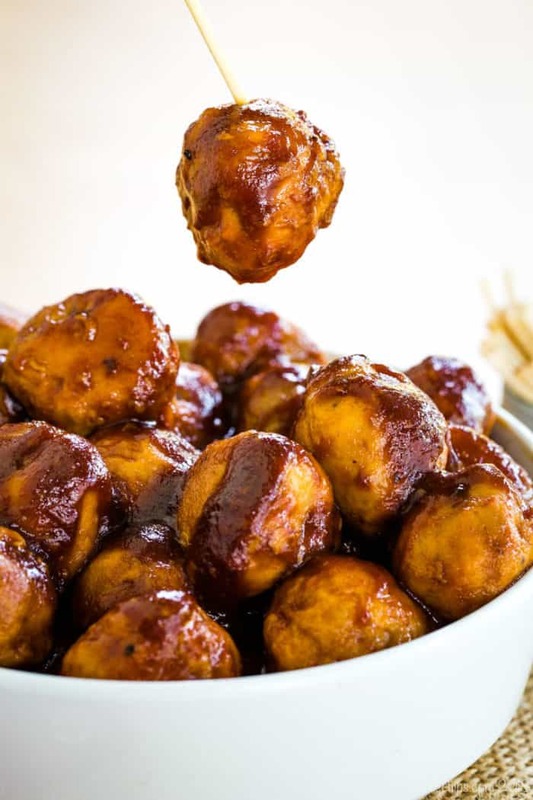 How to serve Apple Cider BBQ Turkey Meatballs? 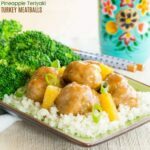 If you are having these meatballs for dinner, serve them with your favorite sides like Cheddar Bacon Mashed Potatoes, Brown Butter Mashed Butternut Squash, Baked Cauli-Tots, or baked sweet potatoes which you can make in your oven, crockpot, or Instant Pot. 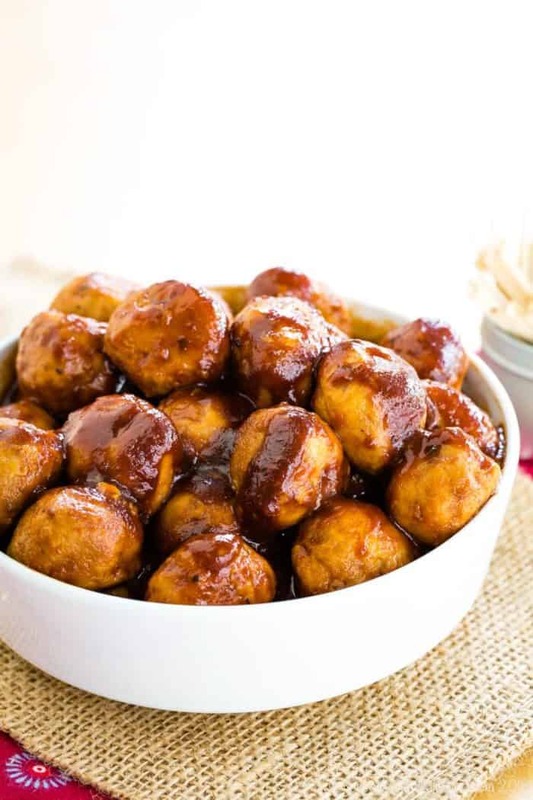 If you’d like to serve them as appetizer meatballs, you can just place them in a bowl or serving dish and be sure to have toothpicks to pick them up. 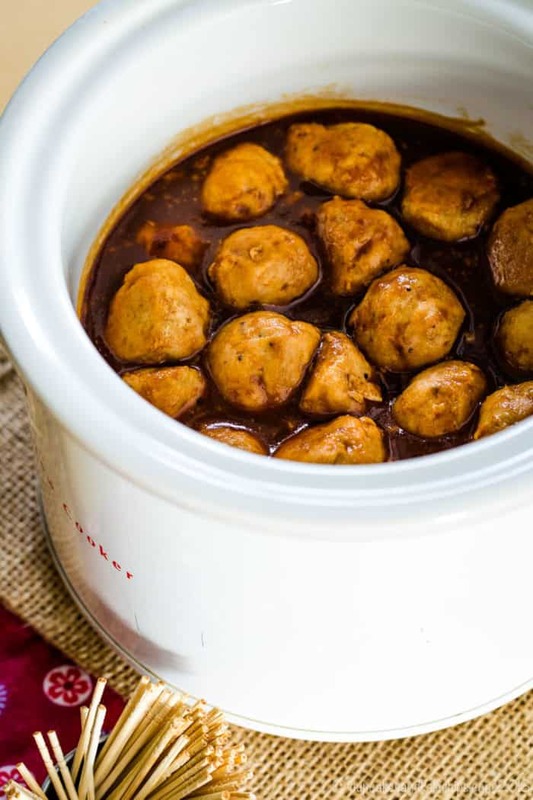 Another option is to combine the barbecue sauce and apple cider in a mini crockpot, then add the baked meatballs. This will keep them warm through the whole party. I have a super basic one like this 1 1/2 Quart Crock-Pot. While it doesn’t have a bunch of settings and features, I don’t use it often, and to just keep stuff warm it does the job. What are more meatball recipes? Plus here are 11 Amazing Meatball Recipes From Around the World! What barbecue sauce do you use? You can use your favorite barbecue sauce, depending on your preference for sweet, smoky, and spicy sauces. I always use Stubb’s Original Bar-B-Q Sauce. They are not a sponsor, it’s just my favorite. It has no high fructose corn syrup, is gluten-free, and isn’t too sweet. While for this recipe I like the sweeter flavor, thus the apple cider, I don’t typically like super sweet barbecue sauce. That means for this recipe when I add the apple cider, it has the perfect level of sweetness. 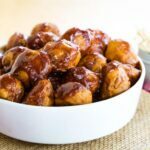 Easy turkey meatballs are coated in a sweet and savory mixture of your favorite barbecue sauce and apple cider for a simple dinner or party appetizer. 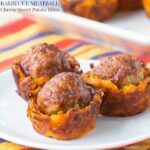 Kids and adults love these either for dinner or as appetizer meatballs! Low in calories and easy to make gluten-free meatballs with a simple swap of the bread crumbs. Preheat the oven to 400°F and lightly coat a baking sheet with cooking spray or oil. In a bowl, combine the ground turkey, bread crumbs (or oats or almond meal), egg, salt, pepper, paprika, garlic powder, and onion powder. Gently combine with your fingers until fully mixed. Using about a tablespoon of the mixture for each, shape the mixture into balls and place on the prepared baking sheet. Bake for 14-17 minutes or until firm and cooked through. Combine the barbecue sauce and apple cider in a saucepan or small slow cooker and warm gently. Add the cooked meatballs and heat through for about 5 minutes.